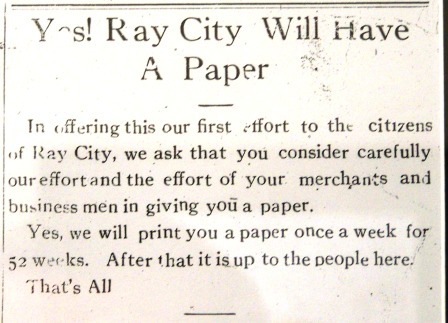 As previously mentioned, Ray City, GA once boasted its own newspaper, known as the Ray City News. As it turns out, there ARE a very few existing copies of the old hometown rag on display at the Ray City, GA City Hall. This blog will be bringing forth transcribed articles as they can be made available. Prior local histories mention Harvey Terry as the paper’s editor, but he has no presence in the known copies of the paper. When the Ray City News went to press in 1929, those at the helm were M. F. Folsom, Manager and Editor, and F. G. Thompson, Assistant Manager. The paper was owned by the South Georgia Publishing Company. The Volume 1, Number 1 edition was dated Thursday, January 3, 1929. Subscriptions were $1.00 per year.